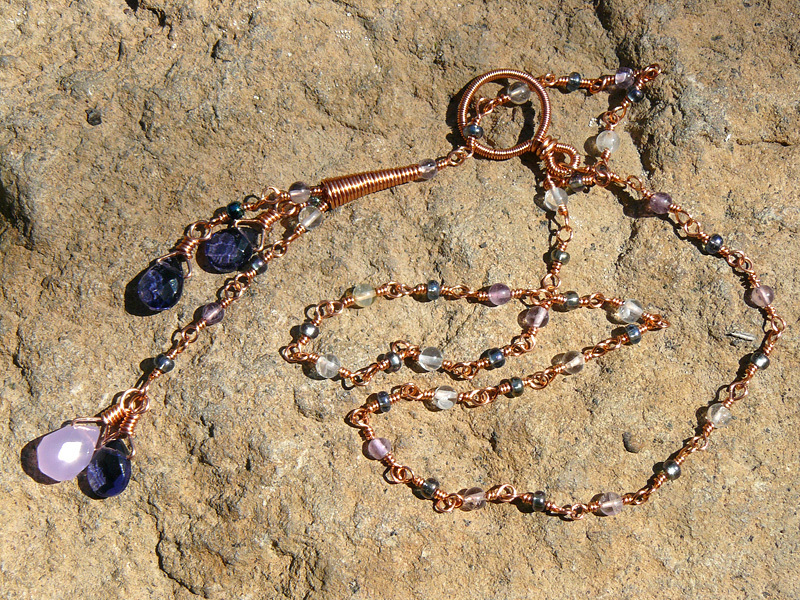 Lariat necklace in copper, with various quartz and glass drops and beads. 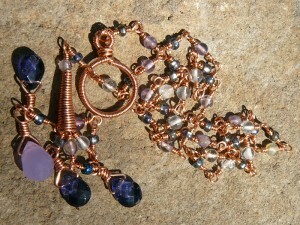 Over the weekend, I attempted some wirework projects from my newest book find, Wire Jewelry Masterclass by Abby Hook. 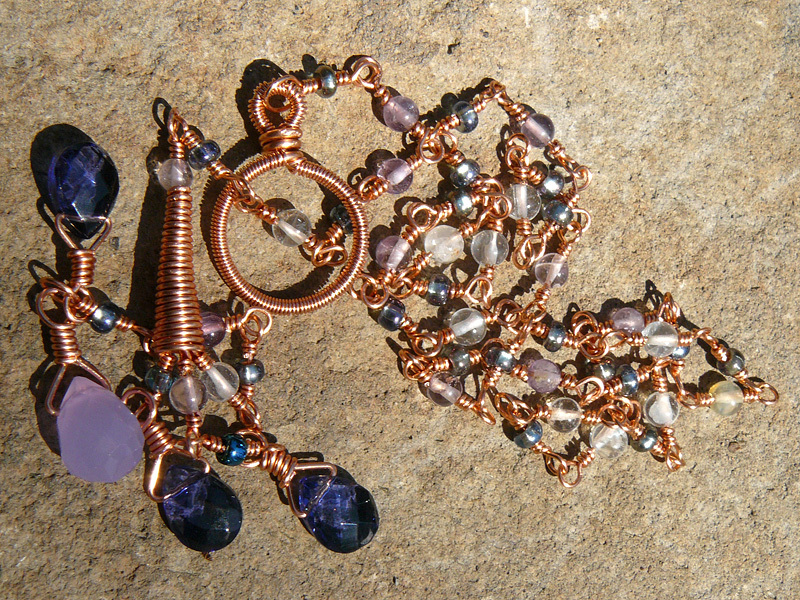 I started out making a wrapped wire toggle clasp, as the wrapped circle is used in the lariat necklace seen at right. While not a project I planned to make first off, the different components required, and the amount of components required, seemed like good practice for my wire techniques in general. (Hello, rosary loops. I made a whole bunch of you. I now see why there’s special combination pliers, just for doing this sort of work.) I believe I spent 5-6 hours on this, in the end, spread over two evenings. Wrapped rings, in copper wire. Having finished the necklace, I tried a ring project, which took me two tries — the first one is on the right, the second one is on the left. 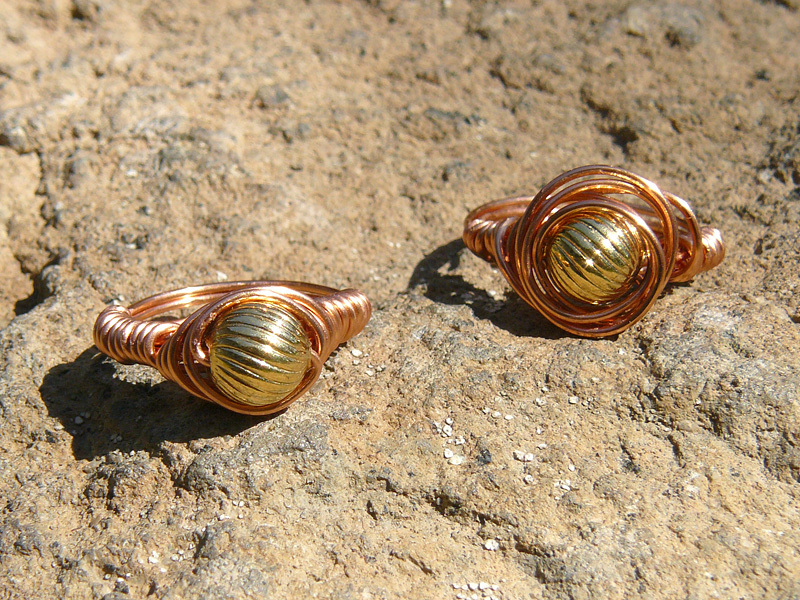 There’s something kinda fun about the first one, but the wirework on the second is far better. Practice makes perfect! One of the hardest things about this project was finding beads of the right dimensions, drilled large enough for two wires to pass through. I think, were I to make more of these, I would order beads in advance, as almost nothing I had on hand sufficed. 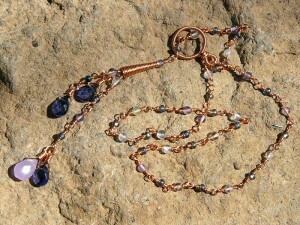 A pile of lariat necklace! Not the most flattering picture of the piece, but I like it anyway.